The Art of Basketball has arrived. After releasing three seasons of Edo—Ball we are very excited to share our new book, Edo Ball — The Art of Basketball. 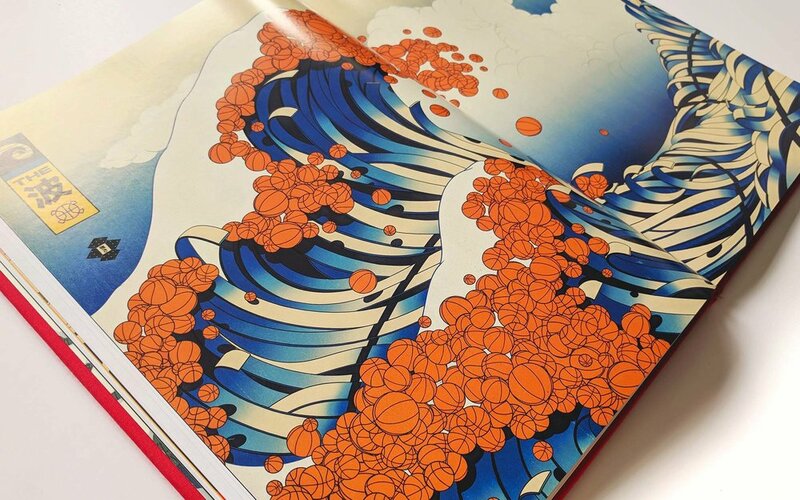 Edo—Ball is a series of 32 artworks inspired by Basketball, Japan, NBA and Culture. 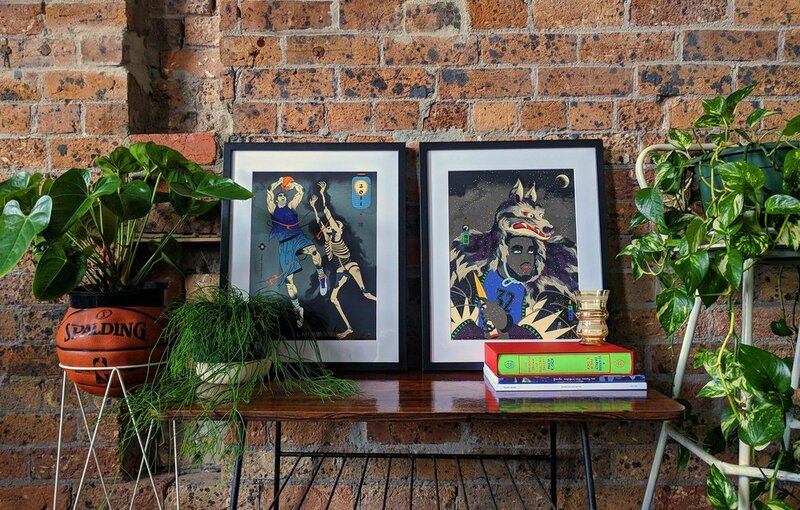 Each artwork is created from scratch and has a unique story behind it. Beautiful basketball art presented as museum quality prints on archival paper. Thank you and enjoy the series. The hall of fame features the greatest of all time. Just like great NBA basketball players have lasted the Edo Ball basketball art series has also. We have produced many great NBA art pieces and have some that fans of the game truely appreciate in a big way. These artworks include the Splash Brothers, Lebron James as a Shogun, The Klawe and more. The torii is a gateway that signals the transition from the profane to the sacred in the Shinto religion. In many ways basketball is a gateway for people and their communities. The game offers a special sacred place to make friends, laugh and share stories. It is a place where people go to escape their stresses and come together as one to strengthen bonds and community. People of all backgrounds, religions and countries gather and even though they often speak different languages or have different beliefs, they are united in their love of the game. There are no barriers to who can play—the gateway is open to everyone. With the new capital came new weapons. Shōgun James joined forces with a new set of ronins and has crafted a new set of battle weapons and armor to ready his forces for the upcoming season. His new shoe features an imperial velvet purple upper and a forged golden edo metal sole. Along with his iconic katana Shōgun James adopted a new weapon on his arrival to Los Angeles. The LA Shuriken is golden throwing star crafted by Emperor Magic and his skilled swordsmiths to help assist Shōgun James in his long and difficult journey ahead. Allen “The Answer” Iverson was a polarizing figure in the NBA but there was no denying his god-like ability to ball. Generously listed at six feet tall, what he lacked in height he made up for with an unmatched competitive drive to win. A.I. was known for his ability to bring defenders to their knees with his tenacious crossover, also known as an “ankle breaker.” A feint to one side and then a quick change of direction gets the defender going in the wrong direction, putting great stress on his ankles as he tries to recover. Sometimes he manages to stay with the attacker, but sometimes he falls down completely, clearing a path to the basket. Stephen Curry and Klay Thompson are “The Splash Brothers,” the start-ing backcourt duo of the Golden State Warriors. The Splash Brothers’ nickname refers to the duo’s ability to “splash” the net with the ball, particularly on long-range three-point shots. Arguably two of the greatest shooters of all time, The Splash Brothers can make it rain from anywhere on the court. Their shooting range, quickness of release, and fundamental shooting form makes them a tough cover for anyone. The Splash Bros are the backbone and in large part responsible for the Golden State Warriors’ siege on the NBA, with four straight finals appearances and championships in 2015, 2017, and 2018. This is the second of the two original artworks that inspired this series. A yūrei is a faint spirit or ghost, and they inhabit the earthly realms in many different forms, depending on the circumstances of their deaths. Some yūrei will remain to haunt a specific place or person until they are finally put to rest. Basketball players who have been dunked on spectacularly, or ‘posterized,’ will often return to haunt the site of their posterizing, unable to transition beyond the agonizing horror of their shame. Only when its purpose for existing is fulfilled will the yūrei be able to move on to complete the cycle of reincarnation. The spirit of Andrei Kirilenko still remains at Oracle Arena in Oakland, home court of the Golden State Warriors, where some say he is awaiting the return of Baron Davis and the 2007 Warriors, hoping for another chance at blocking one of the most devastating dunks of all time.